According to multiple reports on Monday, Ron Johnson has been fired from his post as CEO of JCPenney, with Mike Ullman to retake the position he left in 2011. 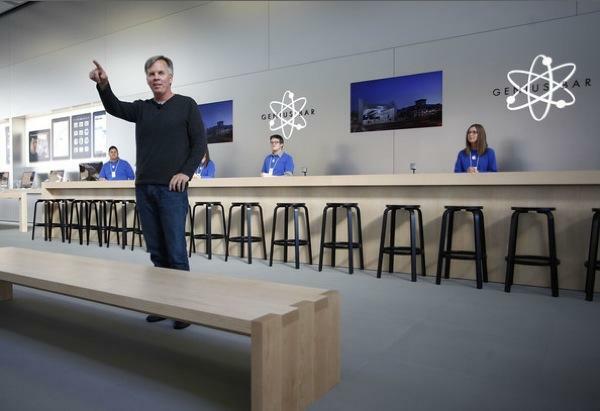 Ron Johnson opens a Chicago Apple Store. News of Johnson's departure was first published by CNBC, which cited a source familiar with the situation as saying the chief executive would be stepping down. In a follow-up to the initial report, JCPenney issued a press release to Forbes, which included a statement from chairman of the company's board Thomas Engibous. "We are fortunate to have someone with Mike's proven experience and leadership abilities to take the reins at the company at this important time," Engibous said. "He is well-positioned to quickly analyze the situation jcpenney faces and take steps to improve the company's performance." After leaving Apple in late 2011, Johnson took on the role of chief executive at JCPenney, hoping to revitalize the storied company's image after finding rousing success with the Apple Store. However, a series of sweeping changes, including bans on sale pricing and the promotion of trendy products through "stores-within-a-store," didn't bear fruit. Since Johnson took over as CEO, JCPenney has posted losses each quarter, with the company's stock dropping over 50 percent. For the firm's retail giant's fiscal 2012, revenues were down $12.99 billion, equating to a 27 percent drop from the year previous to Johnson's tenure. With news of Johnson's departure, the stock spiked some 10 percent in after-hours trading. Johnson is largely attributed with the creation of Apple's brick-and-mortar retail chain, which most recently raked in a record $6.4 billion in sales during the 2012 holiday quarter. HIs old post at Apple is currently vacant after John Browett was fired following a series of reports pointing to strategies not inline with traditional Apple Store practices.